The Best Shark Dive in the World! 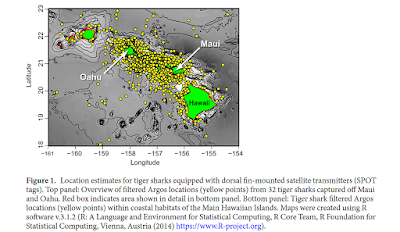 : Tiger Sharks in Hawaii - Paper! Tiger Sharks in Hawaii - Paper! 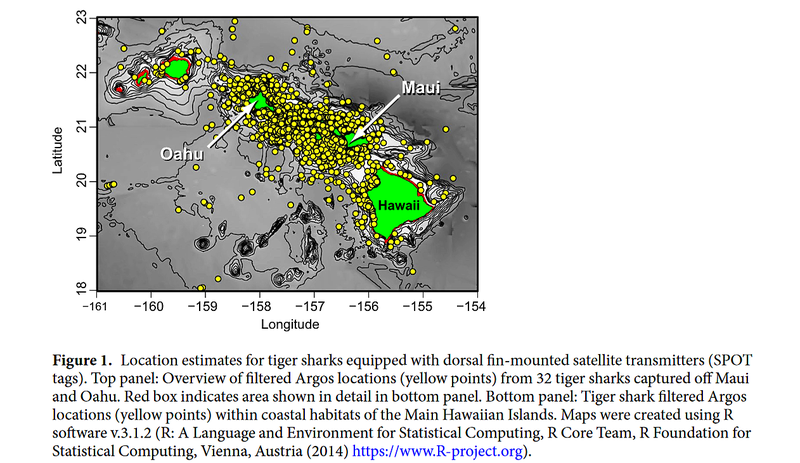 Although tiger sharks clearly utilize open-ocean habitats in both Atlantic and Pacific oceans, the majority (78.7%) of satellite location estimates for tiger sharks captured around Maui and Oahu during the present study were in coastal waters over insular shelf habitat. Tiger shark affinity for coastal waters and shelf habitats has been documented in previous studies in Hawaii, Australia, the Galapagos, the Bahamas and Florida, although movements are generally much wider-ranging over the extensive continental shelf areas off Australia and Florida, than over the smaller insular shelf habitats surrounding the oceanic islands of Hawaii or the Galapagos. Conversely, most tiger sharks tagged at Challenger Bank (Bermuda, Atlantic Ocean) predominantly used open-ocean habitat. These apparently conflicting patterns of open-ocean versus coastal habitat use by tiger sharks may partly stem from the demographic characteristics of sharks tagged in these different studies. For example, eighteen (95%) of 19 highly-migratory tiger sharks tagged at Challenger Bank were mature males, whereas tiger sharks tagged during the current and previous Hawaii studies were mainly (59–80%) mature females which predominantly utilized coastal habitats, and tiger sharks exhibiting high coastal residency in the Galapagos were predominantly (85%) sub-adult females and males. These differences in habitat use are consistent with habitat segregation among different life history stages, with sub-adults of both sexes and mature females occupying coastal areas, and mature males occupying offshore habitats, but likely also reflect the species ability to adapt the scale and pattern of movements to local resource distribution. Once again, Hawaii's Shark Research Team has produced a stellar paper focusing on the residency pattern of Tiger Sharks between Kauai and Maui. Dunno about you - but I just love love love this stuff. Step by step, all that initially rather baffling local, regional and global sneaking around is being deciphered, and I'm just totally fascinated by the insights. Enjoy the new paper - required reading! Florida Land-Based Shark Fishing - Progress! «Einstein» unter Haien - Teil 2! FIRST TIME SHARK DIVING IN FIJI! «Einstein» unter Haien - Teil 1! Einstein - Blut und BRAT! Für unsere Freunde in der Schweiz: Einstein! Florida Land-Based Shark Fishing - FWC Meeting! Shark feeding in Bora Bora - Paper! One of the Greatest Experiences You Could have! Caribbean Reefies are not Apex Predators - Paper!